WASHINGTON, Mar 2 2012 (IPS) - While Israeli leaders historically have enjoyed not insignificant influence with their U.S. counterparts, Prime Minister Benjamin “Bibi” Netanyahu will likely arrive at the White House next week with a little extra boost in his efforts to get President Barack Obama to toughen his already hard line against Iran. Not only is that because the vaunted Israel lobby – whose premier organisation, the American Israel Public Affairs Committee (AIPAC), will be holding its star-studded annual convention here beginning Sunday – has been working overtime to hype the “existential” threat posed by Tehran’s nuclear programme to the Jewish state’s survival. 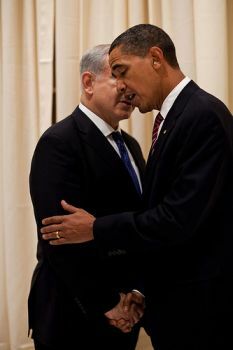 Nor is it related only to the fact that three of the four Republican presidential candidates are repeatedly accusing Obama of being “soft” on Iran and insufficiently committed to Israel’s security, thus seeking to drive a wedge between the president and Jewish voters and donors. The extra boost on this visit is provided by growing concerns over the convergence of steadily rising oil prices – and jitters in the oil market over mounting tensions between Israel and Iran – with the November elections here. “The biggest hurdle to President Obama’s re-election is almost surely going to be the inevitable rise in gas prices over the summer,” wrote Daniel Dicker, an oil trader who writes a column for financial website, The Street, this week. Although Israel itself is neither a major producer nor consumer of oil, Netanyahu – whether by design or not – now finds himself in a position to influence the price that U.S. motorists pay at the pump and thus affect Obama’s political fortunes this fall, as noted Thursday by Gal Luft, the Israeli-born director of the Washington- based Institute for Global Security, in an essay published this week by foreignpolicy.com. After all, back in the summer of 2008, oil and petrol prices reached all-time highs, helping to propel Obama to victory over Republican Senator John McCain in the presidential election that fall. Indeed, oil experts cited by the New York Times estimate that recent Israeli-Iranian threats and counter-threats, combined with U.S. pressure on third countries to reduce Iranian oil imports, have increased world oil prices by as much as 20 percent. The same experts estimate that an actual Israeli attack on Iran’s nuclear facilities would by itself provoke a further spike in oil prices on the order of 15 to 25 percent, adding at least 50 cents to petrol costs at the pump, which are now averaging close to four dollars a gallon. “If the price of oil goes up to five dollars a gallon or more, it would not be good for Obama’s re-election,” according to Charles Ebinger, an energy expert at the Brookings Institution. But such an increase could be prolonged or multiplied if Tehran retaliated by following through on threats to close the Strait of Hormuz – even if only for a few days – or by striking, either directly or through proxies, critical oil- and gas-production or refining facilities in Saudi Arabia, the United Arab Emirates (UAE), Qatar, or Iraq, where Iranian-backed militias are well-placed to cause havoc in the southern oil fields. “The most dangerous scenario would be if the Iranians were to retaliate against some of the Gulf states either because one or more let (the Israelis) over-fly their territory or another reason,” Ebinger told IPS. “If they were attacked – especially the major refineries in Saudi Arabia or the main LNG (liquefied natural gas) facilities in Qatar – oil and gas prices would go through the roof,” he said. An Israeli attack “could be a stunning success, or it could just as easily unleash a chain of events that would bring the world to the brink of the Greater Depression,” agreed Luft. He argued that success would be better assured if the U.S. carried out the attack because, unlike Israel, it has the military resources to destroy Tehran’s conventional retaliatory capabilities, as well as its nuclear facilities. But even without an attack, the persistence of Israeli-Iranian tensions through the summer ensures that petrol prices will remain 10-20 percent higher than they otherwise would be. Moreover, those prices will likely increase as demand grows with the ongoing – albeit slow – economic recovery and as supplies, whether due to sanctions against Iran or declines in exports from other sources, such as Sudan or Nigeria, tighten. Netanyahu is expected to demand that Obama toughen his rhetoric against Tehran, deploy more firepower in the region to increase the credibility of a U.S. military strike, and offer concrete assurances that Washington will indeed take military action if Iran’s nuclear programme crosses certain “red lines”. If Obama acquiesces, Luft noted, the current 10-20 percent Iran- related premium on oil prices could go higher yet. But rejection of those demands could also send prices higher because Israel may be considered more likely to take unilateral action with or without U.S. approval. There are ways for Obama to overcome his predicament, according to Luft, who is closely associated with a number of prominent neo- conservative hawks. Netanyahu may be willing to hold off on striking Iran until after the November elections in exchange for such prizes as the release of convicted Israeli spy Jonathan Pollard, a major new U.S. weapons deal, and an increase in missile-defence spending for Israel in the administration’s 2013 budget, according to Luft. Such an agreement would presumably be accompanied by a U.S. commitment to strike Iran if its nuclear programme crossed certain red lines. But Luft’s preferred option is something else altogether. Obama, he wrote, could “take ownership of, and lead, the military option against Iran, and reinvent himself as a war president in the hope that American motorists will view their pain at the pump forgivingly as part of their patriotic duty. Luft’s essay, however, leaves out a number of other possible factors that could both reduce the Iran-related premium and enhance Obama’s chances of being re-elected. It ignores, for example, Iran’s own potential influence – for good or ill – on the oil market, according to Michael Klare, an energy specialist at Hampshire College. “Netanyahu can have a lot to say about the price of gasoline, only so long as the Iranians play along,” he said. “But if tomorrow the Iranians say, ‘We’re going to negotiate seriously to resolve this,’ then he won’t have any cards to play any more,” as tension – and the Iran-related premium – ratchets down. Indeed, any progress in negotiations between Iran and the P5+1 – the U.S., France, Britain, Russia and China – which most analysts believe will resume after a year’s hiatus at the end of this month or in April – could have that effect.